The first of a sequence of poems alluding to boyhood during World War II. The sight of recycled railway sleepers transports the speaker back to the lost domain of wartime childhood. Within this context, references to Poland and the positioning of other key-words in the narrative provide a potential link with the period’s more chilling phenomena: wartime concentration camps. Once: a time when Heaney’s local railway-line, now closed, was active. Railway-sleepers in situ were a common sight, block-built criss-cross and four-squared with a characteristic smell: We … breathed pure creosote, a common preservative still applied to raw timber. Time has passed; the sleepers have proved to be ideal for the garden, laid and landscaped in a kerb/… half skirting, half stockade, overtaken by the garden growth, perhaps, but ever strong and weathered: bulwark bleached in sun and rain/ And the washed gravel pathway showed no stain. As the speaker’s footsteps echo on the garden path parched riverbed/ Flinch and crunch his involuntary memory recalls the sight and smell of congealed tar: a tarry pus/ Accruing, bearing forward to the garden/ Wafts of events that unfolded alongside each other (conspired) at the time when, as a youngster, he would lie/ Listening for the goods (-train) from Castledawson struck even now by its relaxed pace and the rattle of its rolling-stock: Each languid, clanking wagon. Heaney can recall what was left once the train had passed – the essential ingredients of those cherished moments he spent by the rail tracks close to home: rust, thistles, silence, sky. 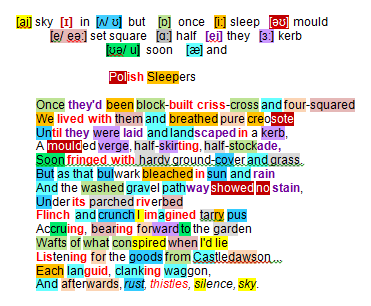 Heaney seems to move towards more unpalatable associations with wartime, hiding Holocaust-style camps behind specific vocabulary: Polish (where many such were located)/ block/ stockade/ bulwark/ conspired/ waggon.